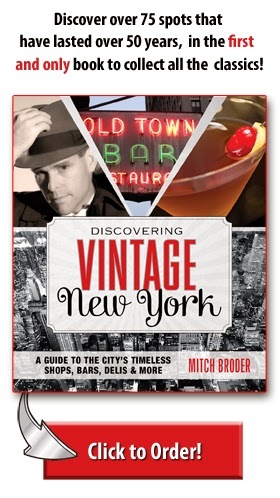 Mitch Broder's Vintage New York: The Automat: A New York City Icon is Slotted for a Comeback! The Automat: A New York City Icon is Slotted for a Comeback! Your nickels won’t go into the slots, which is best, since they’d buy paper food. Still, you can’t deny that the Automat is back. Not the entire Automat, but a twelve-door section of one, complete with windows, slots, knobs, and prices from one to four nickels. It opens, so to speak, at 11 o’clock on Tuesday morning, along with the new First Avenue branch of the 2nd Ave Deli. It used to be in the Second Avenue branch of the 2nd Ave Deli. There, too, it was just inside the entrance. When that store closed in 2006, the relic was put into storage. I’ve been waiting for it to come out ever since. The owners humored me with an exclusive preview. It is magnificent. It evokes a beloved tradition of New York City, even if the tradition did get its start in Philadelphia. In keeping with its home, it offers only Jewish deli food, and only pictures of that. But you still want to deposit your coins and turn a knob. Of course, the opening on Tuesday is actually more for the deli. And that’s fitting, since, unlike the Automat, it has survived. The new deli is also magnificent. (It wasn’t finished, so I couldn’t take pictures.) And it marks a milestone for one of the best-known families in Jewish deli history. The 2nd Ave Deli opened at the corner of Tenth Street in 1954, which was late in the day for Jewish delis. But Abe Lebewohl didn’t care how late it was. Having worked his way up through the deli world, he turned the tiny former luncheonette into a 130-seat institution officially approved by Jackie Mason. On March 4, 1996, on his way to make a bank deposit, Abe Lebewohl was shot and killed. His family resolved to keep his life’s work alive. His brother Jack ran the deli till a rent dispute closed it ten years later. But Jack’s sons Josh and Jeremy reopened the next year on 33rd Street — and are now about to open a second branch, for the first time. 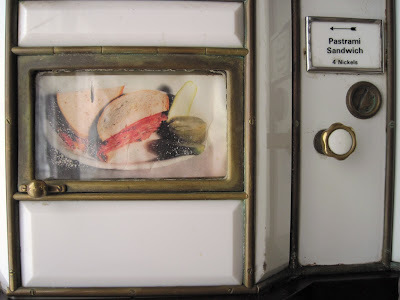 As for the real Automat, it predated the 2nd Ave Deli by half a century. Joe Horn and Frank Hardart launched it in Philadelphia in 1902. The first New York City Automat opened in 1912. 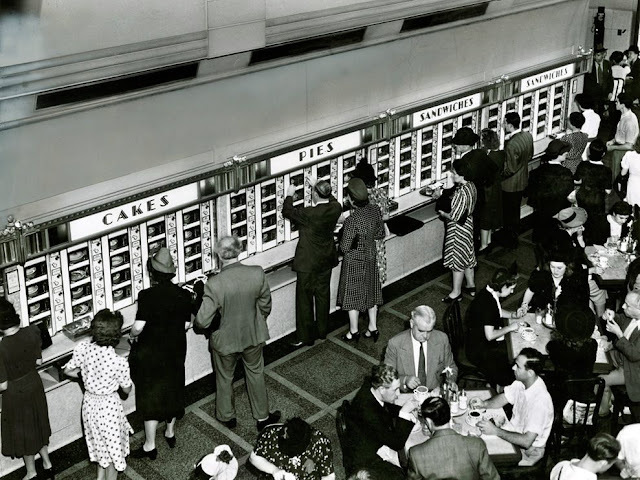 By mid-century, dozens were dispensing the likes of Salisbury steak, baked beans, and pumpkin pie. An Automat photograph made in 1942 by J. Baylor Roberts. From the National Geographic Image Collection. 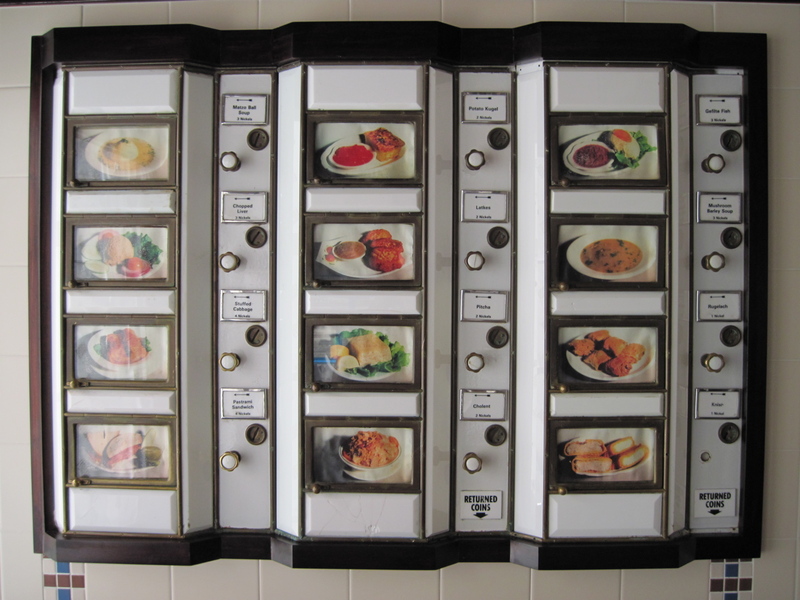 The mission of the Automat was to sell good food cheap. The appeal of it was such that moguls and movie stars went there anyway. It got poor people through the Depression and got rich people into the papers. It was good for everyone. Especially for Joe Horn and Frank Hardart. New York again has only those two types. But it has no more Automats. They all succumbed to the usual scourges of cities — notably, the suburbs. Plus food has just gotten too serious, and besides, it’s gone up too much. To buy a 2nd Ave Deli pastrami sandwich at the Automat, you’d need 319 nickels. But it’s a good pastrami sandwich. And the new deli is a great tribute. “We want to make sure that it lives up to what my uncle would have wanted,” Josh Lebewohl told me. 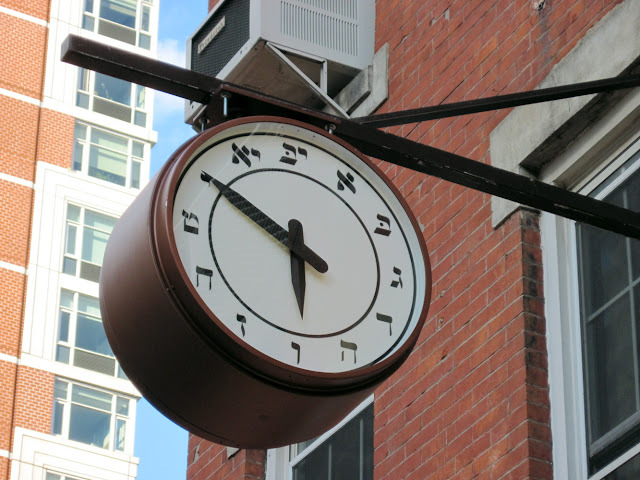 The new deli also has this nice clock. Drop some coin starting Tuesday at the new 2nd Ave Deli, 1442 First Avenue, at 75th Street, in Manhattan. Awesome! Let's go! Do they serve pastrami burgers? I need one closer to CT. We'd better hurry...it's 10 minutes to Vav! How exciting is this news? Thanks! I've got a pocketful of nickels! Let's go. Good luck 2nd Ave Deli! This is a MUST, since I actually remember the original automat! It was still open when I first moved to NYC in 1977. GREAT find, Mitch! The Automat... every year at Christmas my mom would take us "into the city to see the tree." We'd start at Altman's at 34th St on Fifth Avenue to see all the store windows on our way to Rockefeller Center. Then on to my dad's office on Park Avenue. We played with the ELECTRIC TYPEWRITERS which were so cool, and everyone could ooh and aah over us. Then we'd all meet my grandfather for lunch at the Automat on 6th & 57th. That was the first place I had lemon meringue pie. I suppose my visceral response to that post is what you're is looking to share -- thank you, I'll be smiling all day. And craving lemon meringue pie. The Automat always brings up memories of the Horn & Hardart Fruit & Nut Bars & Sugar Cookies we brought home from there. Does ANYONE know where to find a recipe for them ? Or better yet a place to order them now ? Does anybody remember the Cream cheese and date nut bread loaf that they used to sell at the Horn & Hardart with a cup of coffee for 15 cents? For twenty years, I wrote about New York for the nation's largest newspaper chain. Now I write about New York for the nation's largest Internet. I do this because I love to explore the city and to share what I've found, except when I'm greedy about it and decide to keep it to myself. "Vintage," of course, means old, but it also means timeless. It's my defense for covering new things that evoke old New York spirit. But I mostly cover the best places that take you back in time, whether you are revisiting a time or just now discovering it. On the street I still feel like a tourist, and I tend to look like one, too. These are perhaps my greatest qualifications. Among my others are some of the top prizes in New York City journalism, which nobody really cares about because they're not a Pulitzer.